Three years ago, for a number of reasons. my husband and I moved to Los Angeles…Santa Monica to be exact. 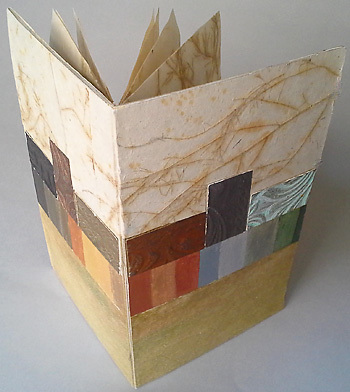 Since that time, I have become involved with the making, study and teaching of artist’s books. 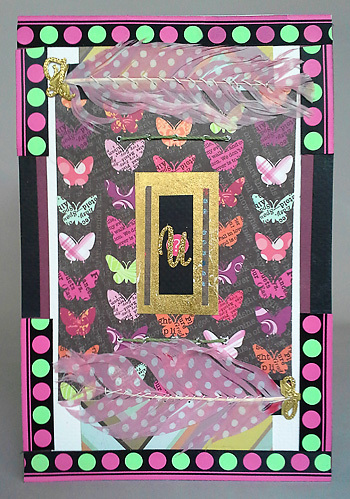 I teach bookmaking around Santa Monica and LA County, and am continuously evolving my own expression of this unique art form. 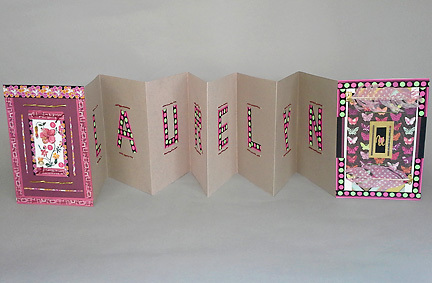 Bookmaking, creating handmade books, unique books, artist’s books, and the book arts overlap as activities. In essence, they employ the form of The Book as an expressive vehicle. 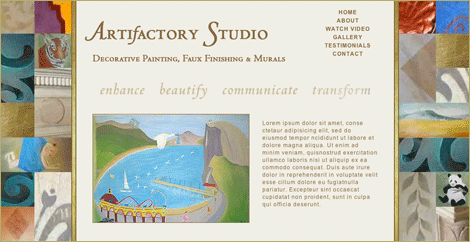 I have been the principal of my own decorative painting company, ArtiFactory Studio, for many years, primarily in San Francisco, where I resided, also for many years. 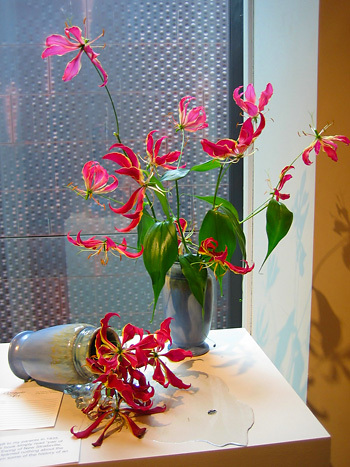 In this post, I begin to share how I am finding ways to put these two forms together, one, bookmaking, often associated with the small-scale and intimate, and the other, decorative painting, often large-scale, which includes mural painting, glazing, faux finishing, gilding, and a myriad of other ways of “treating” the built environment, IE, the environment created by us humans as the setting for our activities. Gilding, or the act of adhering metallic leaf over a surface adds a bit of bling, depth and dimension to an already complex surface on this handmade book cover. 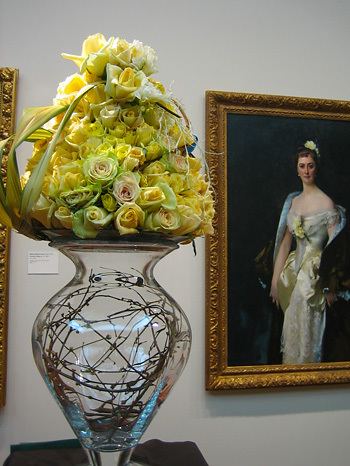 The gold rectangle also provides a focal point for the eye to rest on, adding order, focus and coherence to the piece. A piece of board was gilded, then added to the surface collage. Texture can be a huge part of decorative painting. 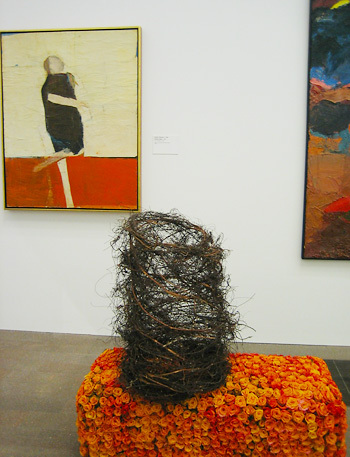 The artist manipulates glazes, paints and other materials over a surface to create both visual and physical texture. Here crumpled tissue paper is adhered to the surface in layers, giving it a satisfying texture, variation of color, and contrast to the look, and feel of the other materials used, which include cloth, hemp cord, beads and paper media. 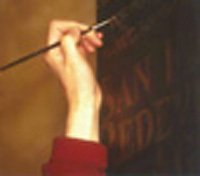 The covers of this book are made of boards that have been dragged or “Striéd“, a technique by which paint or glaze is applied to a surface, and a large stiff brush is used to drag through it while it is still wet, leaving a up and down stripe-like pattern/texture. 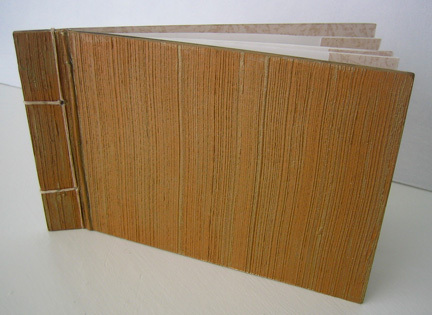 Here a “brown paper bag” feeling is created by using humble brown wrapping paper (and bags) to create an earthy texture on the surface of this book’s covers. Individual pieces of hemp cord are used for the binding, adding to the homespun simplicity and feel. 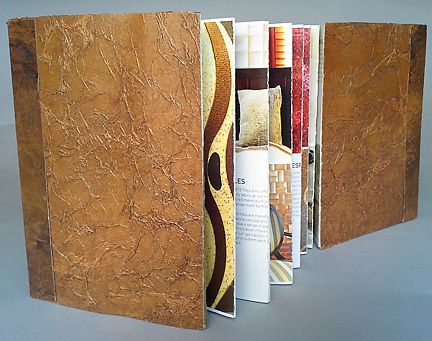 This book is created from boards that were originally painted with metallic paint and glaze samples for a client. I loved how these samples looked together, and added the rust, iron and verdigris sample pieces above them. 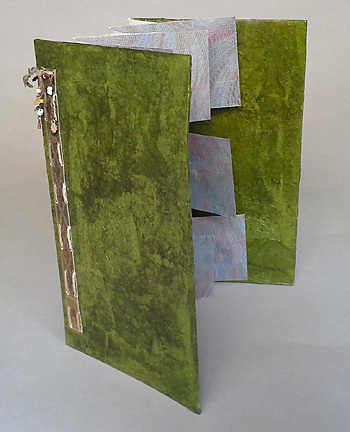 The rest of the book is made of paper with plant material flowing through it. 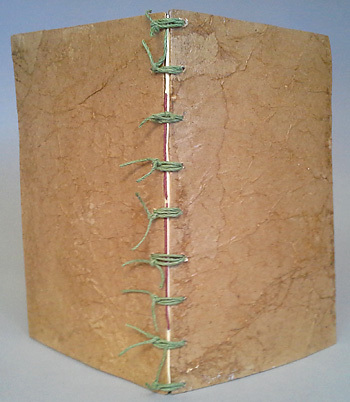 It is bound with linen thread in a single signature (gathering of folded pages). Finally, here is a book with an accordion spine; a “found” spine…meaning that I happened upon a design brochure, and its size, weight and color worked perfectly the book I developed. The covers are made of paper that has been textured, painted and glazed, then glued onto boards. The contrasting “edge design” is created by the addition of another painted and glazed decorative painting sample, glued on the open edge, then folded over, and glued onto the inside of each cover, giving it more stability, integrity, and visual interest. I hope you will join me as I journey through this time of creative transition, exploration, and discovery. Although the waters feel uncharted, there are plenty of inspirational and provocative artists, makers and craftspeople to help light the way. Here’s to diving in! Recently, i was fortunate enough to have colleague, stylist, real estate professional, and “Color & Hue” practitioner extraordinaire, Arden T. Reece of Color & Hue, and The Rudy Group Real Estate, pen the article below about my work as a decorative painter, and highlighting and helping to define it at the same time. and real estate in the Long Beach-based company of Geoff Rudy. She is also a whimsical water-colorist, with a delightful children’s book idea up her sleeve! Please enjoy Arden’s interview and article below, about the art and applications of Decorative Painting! “We sat down recently with Santa Monica based artist, Debra Disman, who recreates rooms and objects with her arsenal of painting techniques. 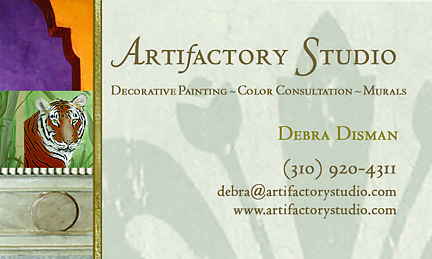 Her company, ArtiFactory Studio, provides custom decorative painting, faux finishing, color consultation and murals to the Residential, Commercial, Institutional and Nonprofit customer. 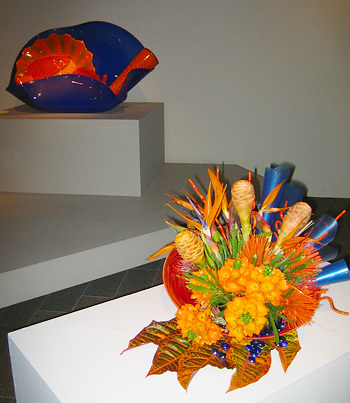 Her work has graced the walls, ceilings and objects of many residences and spaces along the California coastal region and beyond. First off, thanks for agreeing to sit down with us! Your work is amazing and you’re one of those artists that most people don’t know exist but when they find out about you, they’re thrilled! 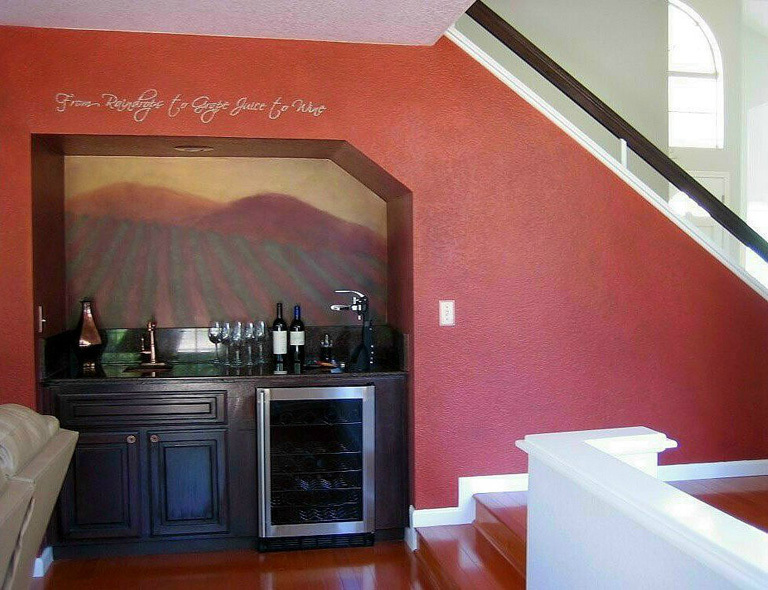 What exactly is a decorative painter? Well, decorative painting is a bit of a “catch-all” term. In fact, the way I use it, it covers much more than “just” painting! Decorative painters use their skills and artistry to transform the ‘built environment’ – usually the architectural environment, both interior and exterior, but more often interior. We work on walls, ceilings, floors, furniture, and architectural details such as fireplaces, columns and molding, using paints, glazes, metallic leaf, and more, to create the look and feel requested by our clients. 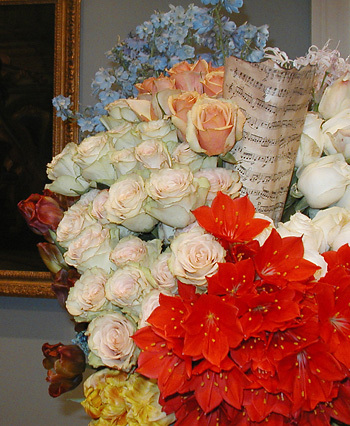 We may create full-scale murals, the look of marble, stone or wood (faux finishing), or apply gold leaf. As I say on my site, “Our passion is to translate the Client’s inner vision into concrete visual form.” I might work in conjunction with interior designers, architects, contractors, painting companies or even graphic designers to develop the textures, color palettes, treatments, mural compositions, designs and patterns that will bring a space to life and give it that extra oomph that can translate into the “wow” factor. Wow is right — you truly are an artist in visually transforming objects and homes through color and paint! Many homeowners love to create unique spaces in their homes but don’t quite know what to do. How do you help them in conceptualizing something? The key is really individualized customer service and the customization of every project. 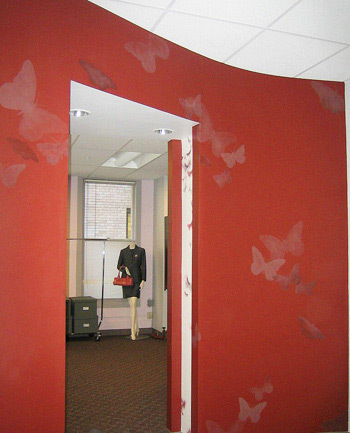 Every finish, mural, design and treatment is tailor-made to the client’s need, environment, interest, and inner vision. How is this achieved? From my complimentary first meeting, through the sampling process, to the finished project, the focus is on hearing what the client (and their team, if they are working with a designer, architect, contractor, or painting company) have to say, seeing what they respond to, and continuing to listen to, respond to and communicate with them to make sure their project is progressing in the desired direction. So…what is the step-by-step process for working with you? How can a homeowner create a great relationship with you so they get your best work? My process for much of my work includes several steps. Once I get a referral, or a potential client has reached out to me, we discuss what they are looking for over the phone, and then set up a complimentary first meeting to review job site and potential project, and further clarify their needs, interests, vision and expectations. This gives me the information I need to determine pricing, so that I can present a quote/make a bid. I consider this meeting my first collaboration with the client, and it also functions as a consultation of sorts. 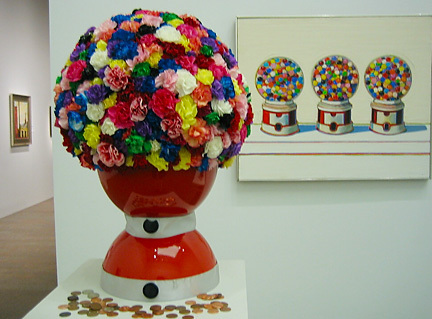 I will then, in most cases, present a written bid based on time and materials, a time-line for the job based on the client’s needs and schedule, and the availability and workload of my studio, ArtiFactory Studio. If the bid is accepted, we sign a contract, and I invoice for a deposit which is usually 50% of the total price. Now the work, and the fun, can begin! Based on meetings with the client, designer or any other “players” involved, I produce samples or mock-ups and submit/present them for approval. I will incorporate feedback and requested changes so that the client and their team’s vision develops along with mine. I will conduct further client meetings and provide consultation as needed throughout the process. Once all plans have been approved, I complete the job on-site or in my studio continuing to be open to client feedback and concerns. When the job is complete, I provide any necessary instructions for maintenance, repair options, and product for touch-up, and go over any questions the client/team may have. The last step in most cases is to invoice for balance due and leave a happy client having exceeded her expectations! One trend that we’re loving right now in the design space is the idea of reuse and re-purpose. What are some things that you’ve done in re-purposing furniture? I am so glad you asked about re-purposing furniture through decorative painting as it is one of my favorite things to do! Not only is it incredibly fun and creative but it also helps to minimize the waste-stream and thus supports the health of our environment, to say nothing of saving money! I have both purchased furniture from garage and yard sales and recreated them with decorative painting techniques and I’ve also taken pieces that I or a client already owned and transformed them into custom items that are specifically designed to work in a particular space. In those instances I work with the client step-by-step to realize their vision, just as I would with any other job. Although you make it look easy to do, I know it’s not! What are some things your clients need to be aware of when it comes to re-purposing their furniture or space? One important thing is to give the process its due. It does take time to clarify what look and feel the client is actually going for and discover the best way to achieve that. There are so many techniques, processes, applications and treatments that can be used…the options are endless! So, the dreaming, visualizing, planning and consultation process is really important, and in most cases should be collaborative, unless the client is willing to offer carte blanche and accept the results! Next, I would say to any prospective client, as for any project, have fun with it! This is a process designed to put your vision into concrete visual form and it should be fun, exciting, enjoyable and creative for you as the client with gratifying results. 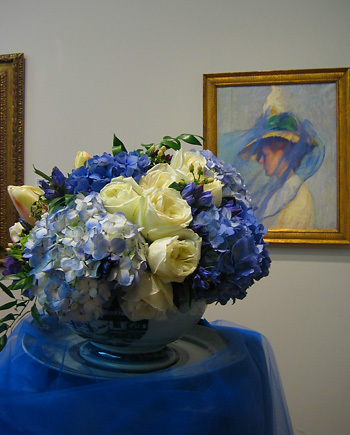 Finally, in working with an artist/decorative painter/decorative artist, understand that you are working with a professional who has trained and practiced their art form or craft (just as your architect or designer has) and that there is a charge for the service. Work out the financial details ahead of time and get it all down on paper, so that everyone involved is apprised of the costs, and agrees to them, and then you can move forward and have a great, creative/collaborative experience. GRATITUDES for this lovely piece!!! In my last post, Letter to a Young Decorative Painter, I shared a list of tips and ideas, advice and recommendations that I had sent to a “young” decorative painter…IE, someone new to the field, who is just starting out, and trying to get clients and build business. How interesting it is to look back, and see all the things we have done along the way to learn, develop, grow, sustain and thrive as an artist, entrepreneur, small business person, and member of the “creative class” and service industry. A more in-depth look at my list seems in order. Maybe it will open some doors for others, wherever they are in their career. Get a good Website, absolutely, to share and showcase your work. Absolutely essential. Anyone, anywhere needs to be able to access images of your work, your contact information, bio, and references, referrals, and testimonials. 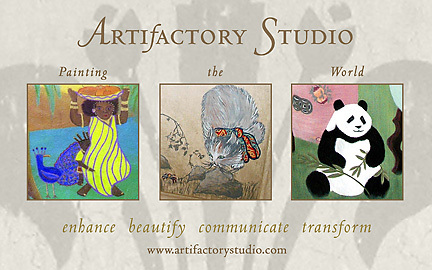 I use my site as my online portfolio, calling card, tool of communication, and catalog! Start small, and develop your site as your business develops. WordPress sites are lauded as being user-friendly, and offering you the ability to update your own site, which can be a boon! You can choose to depict the kind of work you most wish to be hired for, and steer whoever looks at your site in that direction. Start a Blog, focusing on the kind of work you would like to do, etc. Many advise that having a blog is also essential in today’s entrepreneurial world. That may be, but only if you post on it regularly! A blog also can be a tool of communication, a marketing tool, a place to develop ideas and attract audience, followers and colleagues as well as clients, and even create outlines and drafts for other writing projects. I have found that planning specific time each week to post helps get it done. You may want to focus your blog, or a series of posts on specific subjects, or aspects of your business. Network with Interior Designers and Architects, as well as Painters, Paint Stores, and others in the Building/Built Environment field. Networking is key, and there are many ways of doing this, in person, online, by referral, formally, and informally. As a decorative painter, muralist and faux finisher, you may find great resources at your local paint store, design center, or design district. 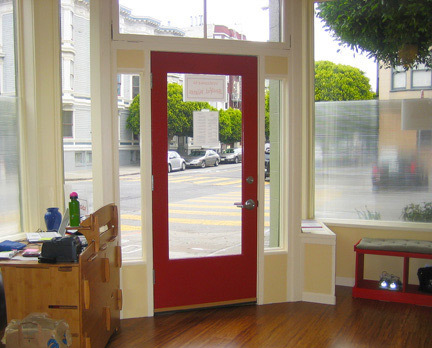 You may want to do some demonstrations of your paint store’s product, offer to do signage, or other small project for a designer or architect whom you admire, and would like to work with, or for a favorite charity, non-profit, or organization. 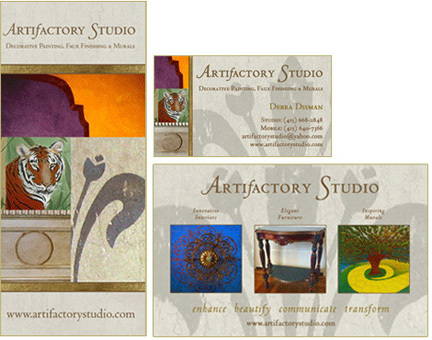 Whatever you do, make sure you have plenty of business cards, and other print material handy to post, and pass out to anyone you want to connect with, or to those who may know others who could use your work. Join a networking group, such as “BNI INTERNATIONAL“, (Business Networking International). (Google it). 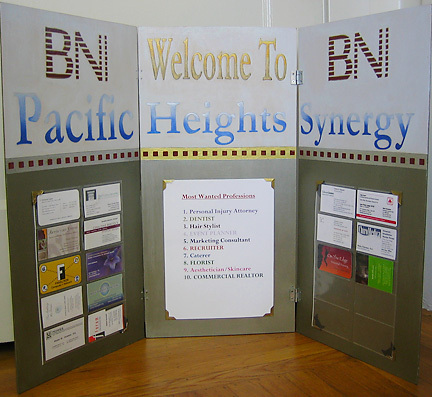 The “BNI” model is a group that meets weekly, consisting of one person only from any profession, with the purpose of referring clients to each other. Many skills, and challenges are inherent in the process: defining your business so that you can share about it to the group, presentation, listening and supporting others, volunteerism, and interaction, to name a few! A tremendous learning and development experience, on both a personal, and professional level. Take an entrepreneurship or business class, or whole program, and put together a Business Plan. Entrepreneurship classes, programs and studies are becoming much more prevalent in our society, and educational systems. You can learn how to create a business plan, and put money, marketing and management mojo to work, in the company of like-minded individuals. looking at your numbers, putting your goals and objectives down on paper, presenting to a group, learning about others’ business plans can be stimulating, clarifying and sometimes startling, but always educational and growth-inducing! Have a selection of good-sized Samples, depicting your strengths, and the kind of work you most like to do, most want to do, and from which you think you will get the most business. What is the work you most want to do? Are strongest in? is most sought after by the potential clients that are most sought after…by you? Create a set of samples, and a way to present them, so you can share with others your abilities, and what you can produce. You are in a visual business, so help potential clients imagine how you could transform their environment through your work. Create brochure, and a postcard, as well as a business card to go with your Site…they should all work together, as your business Visual Identity. Put your card and brochure in Local Paint Stores, and other appropriate venues! This is another arena where you can have fun, and put your color, design and graphics skills to use. it is not possible to do it all, and especially not well, or to professional standards, so enlist the expertise of recommended / vetted and true graphics/web designer to work with you to develop a visual identity system that does you and your work proud. Your web and print presence are your visual calling cards, so make sure you present yourself at your best, and in the way you truly want to be seen. 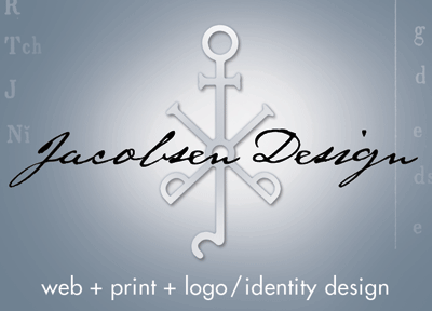 Dianna Jacobsen, of Jacobsen Design is a superb graphic and web designer who can design for clients based anywhere on the globe, and does. Once you have your visual identity, put it out there…put it everywhere! Start an email newsletter (it can be simple) , and start building your Mailing List. Use your postcards! Keep in touch with your clients, potential clients, colleagues, associates and networking partners through digital and analogue means. Email newsletters, blogs and social media can be a great way to stay in touch, but never underestimate the power of a beautifully designed card or stationary, and the handwritten word! Selectively, Do Some High Profile Work, at a Reduced, or no Cost, for 1-3 Clients…to get your name out there, and showcase your skills and abilities. Have a party to celebrate it, at the job site if you can, when completed. If you are not yet known, move to a new locale, change the focus of your work/practice, or have a great opportunity to support a cause dear to your heart, or for an entity that you want to connect with, consider doing a carefully selected and thought-out project that will gain you some visibility, recognition, and contacts, as well as give back to the community. Do not get into a long, costly, back-breaking job that will require elaborate scaffold or expensive materials. Consider something attainable, affordable, and impactful, and then use your communication systems to draw attention to it , create credibility, and potential referrals. Ask the recipient of your efforts for a referral, testimonial or reference, and try to build your business from their. Most importantly, pick a project you will enjoy doing, and let the love show through! 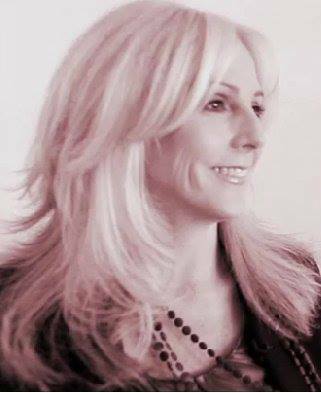 Follow Online: Alyson Stanfield/Art Biz Coach, The Art Business Institute, Artists Who Thrive at Ann Rea Inc., Rebecca E. Parsons at her Artistically Speaking Talk Show on Blog Talk Radio, and Cre8tive Compass Magazine, and “HOUZZ“. You can Google and Facebook all of these to find them, and also “LIKE” them on Facebook. Read all posts, and save those that most apply to you and your work in an email folder. The above are some of my favorites, and if you read their posts consistently, you can substantially add to your knowledge base. 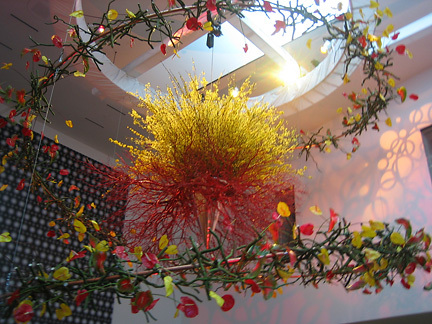 You will also be able to connect to the larger artistic community, and get new ideas! Remember to SHARE their posts on social media, and give credit where credit is due! Get a Facebook Business Page, a Twitter feed, and a Linked In and Pinterest account, and keep up with them…interact and support others in related fields, and post many images. Share, support, educate, inspire and inform. Develop your online presence with care, remembering that as is stated in the wonderful film “The Social Network“, “The internet isn’t written in pencil, it is written in ink.” meaning that, assume that whatever you put on the web is there forever, for any and all to see. So, present yourself truthfully, and as you wish to be seen…hopefully there is not too much of a disconnect between those two (! 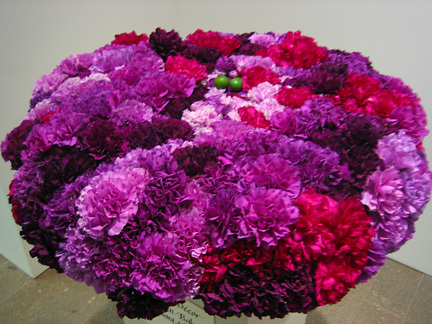 ), and give to others, while spreading your own word and image. 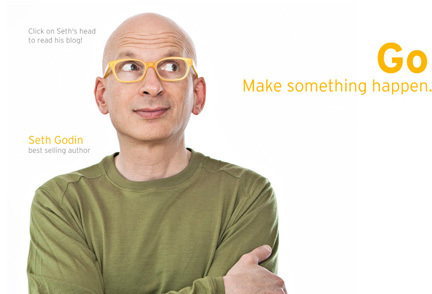 Follow “Seth Godin“ for rich, daily doses information and inspiration. You can research his work through Google/Facebook. Sign up to receive his daily blog posts in your email inbox. Pithy, rich, down to earth advice on anything and everything related to marketing, entrepreneurship, creative business, and more. Easy to read, yet resonant, such that you can reread his words many times over. Enough said…read his generous work! Don’t get discouraged. 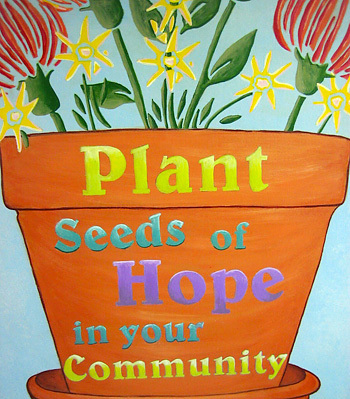 Do something to grow your business every day, keep on plugging, and, don’t forget to help others and give back!!! I would love to hear how You are doing in the comments section! Thank you for reading, thinking, considering, and creating. Bestest wishes!